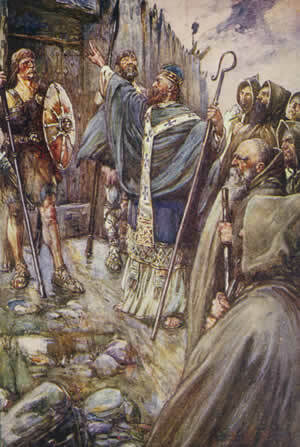 Saint Columba (Irish: Colm Cille, 'church dove'; 7 December 521 – 9 June 597) was an Irish abbot and missionary credited with spreading Christianity in present-day Scotland. He founded the important abbey on Iona, which became a dominant religious and political institution in the region for centuries. He is the Patron Saint of Derry.